Falvey employs undergraduate and graduate students and, whether they are working behind the scenes or in a public space, we appreciate their contributions. The student employees are talented and enthusiastic. They assist at the service desk, process document delivery requests, digitize rare materials, prepare new materials for circulation, and generally bring their ideas, energy and positive attitudes to the workplace. They have learned to use specialized library software, developed important customer service skills and taken ownership of their work. It would be difficult to run the Library without their help. A few of our student employees are pictured below in photos taken at the Student Employee Appreciation Reception, where pizza, soda and desserts were served, and where they were serenaded by library staff. 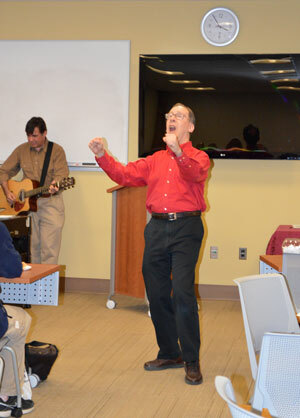 Stephen Spatz, research librarian (out of frame), Joe Lucia, library director and University librarian and Bill Green, Access Services specialist (and resident crooner), churn out “Monster Mash,” a library favorite. 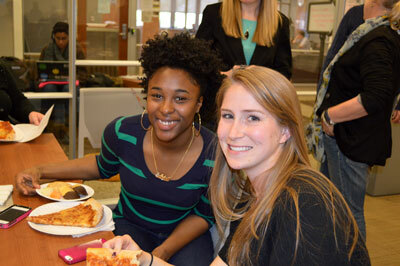 Sabrina Clerssaint and Meghan Rodgers, both graduating in May 2013. 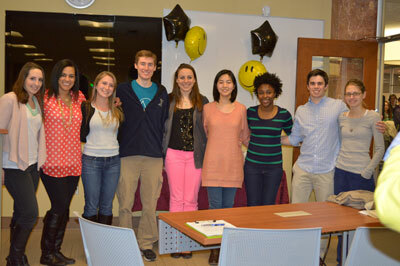 Congratulations and thanks for your hard work! 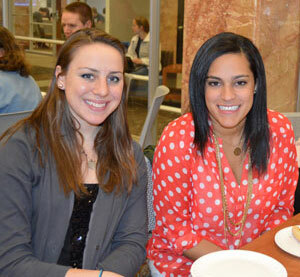 Bridget Kiley and Alison Fernandez, both graduating in May, 2013, work for the Access Services team. They will be missed! Also contributing: Luisa Cywinski is the team leader of Access Services and the editorial coordinator for the Communication & Publications team.